A fan clutch is designed to cool the engine when it becomes too hot and on the verge of overheating. These clutches are featured on forward facing engine's only and are used in place of an electric fan though they do the same job. Attached to the engine's water pump a fan clutch can go bad in one of two ways. First the and most common way a fan clutch can fail is the clutch shoe inside the unit can get stuck and not disengage causing the fan to lock up on the input shaft which will permanently engage the cooling fan which will be accompanied by a noticeable roaring sound. When this happens people like to describe this problem as "it sounds like a jet airplane is taking off next me". 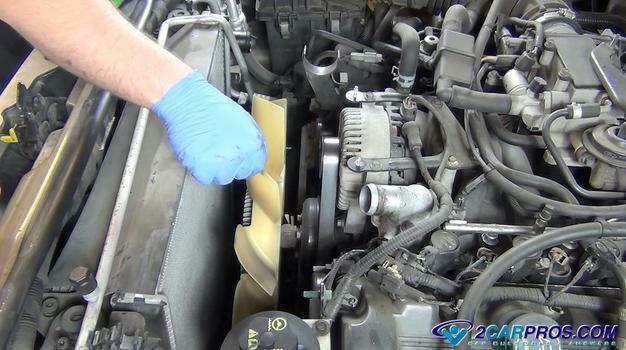 This condition will not make your engine overheat but it will decrease your gas mileage and reduce engine power. To check for this problem open your hood with the engine off. Grasp the fan blade and try to move it. If the fan blade will not move the fan clutch is locked up and replacement is required. The second problem a fan clutch can have is the opposite problem. The clutch fails to engage no matter how hot the engine becomes. This condition will cause the engine to overheat because the fan fails to pull the necessary air through the radiator that cools the engine by the use of the systems coolant. This problem can be detected by listening to the fan while the engine is running and hot, you should be able to hear the fan engage. If you do not hear the fan start working shut the engine off and open the hood. Try to spin the fan clutch it should give a fair amount of resistance. If the fan just freewheels the clutch inside the fan has gone bad and should be replaced to prevent engine damage due to overheating. This problem will also degrade the operation of the air conditioner as well due to the lack of air being pulled through the condenser of the system. If you have any fan clutch questions? Please visit our forum. If you need car repair advice, please ask our community of mechanics who are happy to help. Our service is always 100% free.